In the realm of cult horror films, there are some titles, which are revered more than others. Sometimes it’s for their groundbreaking special effects, at others for the unprecedented scares. And other times yet, it could be because of the film’s relative obscurity, leading to a certain notoriety. Without a doubt, Dario Argento’s “Suspiria” is such a film. Despite the fact that the film was actually released theatrically in the United States (a rarity for Argento’s films) and did fairly well, it has been a challenge for modern audiences to view the film for the longest time, until the dawn of DVD made it more widely accessible. Now, at last, Synapse Films has prepared a 2-disc Blu-Ray version of Argento’s masterful thriller, offering up not only a brand new transfer from a 4K restoration but also a package that is brimming with bonus materials. On paper, the story of “Suspiria” may appear fairly simplistic—perhaps that’s part of its beauty. A young American ballet dancer named Susy Banyon (Jessica Harper) arrives in Freiburg, Germany, to study at a world-renowned dance academy. On the night that she arrives at the school, one of the students in murdered—in a scene which must be seen to be believed—making it impossible for Susy to enter the premises. The next day, however, she is properly welcomed into the Academy by the director Madame Blanc (Joan Bennett) and her teacher Miss Tanner (Alida Valli). But already, during her first class, Susy falls ill and faints. Despite the fact that she’d planned to stay in a nearby apartment, Madame Blanc insists that Susy live at the school until she feels better. It is then that Susy begins to notice the weird goings-on at the academy. The instructors all seem to be in on a big secret and the students aren’t very friendly. Following an attack by maggots and the death of one the school staffers, Susy and her newfound friend Sara (Stefania Casini) decide to investigate the activities at the academy and to learn the truth. What they discover is a dark secret, which was best kept hidden, as the academy is not what it appears to be and the staff may not be human. While that synopsis seems straight-forward and simple enough, seeing “Suspiria” unfold on-screen is another matter entirely. You see, “Suspiria” isn’t about the story, it’s about visuals. I would say that the narrative takes a back-seat to the visuals, but at times it’s as if they aren’t even in the same car. Argento lets just enough of the story sneak in so that he can create his shots. And, oh, what shots they are. Argento and director of photography Luciano Tovoli were able to paint a color palette the likes of which have never been seen before (or since) in a horror film. 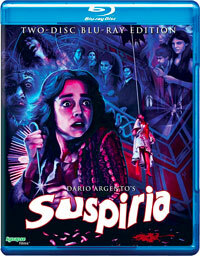 “Suspiria” is dominated by reds, blues, and greens creating an entirely new and eerie world. This color scheme only adds to the nightmarish quality of the film. While some have described “Suspiria” as a dark fairy-tale (indeed Argento calls it this), I prefer to view the film as if you are watching someone else’s bad dream. This unique color technique is accentuated by Argento’s creative camerawork, which filmmakers such as John Carpenter have acknowledged as being inspirational. The camera here is rarely still, as it roams the halls of the dance academy or of the apartment building at the beginning of the film. When the camera is still, Argento shoots through light-bulbs, glasses, and sheets to give the film a unique feel. Argento also alternates using extreme close-ups and long-range shots (as in Chapter 15). The camerawork, combined with the colors, make “Suspiria” one of the most visually unique films ever made. However, it shouldn’t be assumed that the story of “Suspiria”, as flimsy as it may be, doesn’t contribute to the film as well. Argento uses the narrative to set up his disturbing images. And while there are gaping plot holes, factual and continuity errors and some of the scenes don’t entirely make sense, visuals such as the maggot attack, the shadowy figures in the square, the barbed-wire room, and the finale contain some truly unforgettable, grisly images. This goes back to the nightmare motif, which I mentioned earlier. Like in a dream, there are parts of “Suspiria” that make no logical sense, but, like our dreams, it’s the bizarre images, not necessarily the story, that really scare us. “Suspiria” is a monumental achievement in horror, as it is both understated (story-wise) and over-the-top (visually) at the same time. After a limited theatrical run and a limited steel case Blu-Ray edition that was instantly sold out, it is now time for everyone to behold the full glory of this new restoration of “Suspiria.” The transfer for the restoration was taken from the original uncut, uncensored Italian 35mm camera negative and supervised by the movie’s Director of Photography, Luciano Tovoli. Not surprisingly, therefore, the image is instantly stunning when you start up the film. Clean and without blemishes, it the image is bold and razor-sharp and free of grain. Considering how important colors are for this film, I am proud to report that the color reproduction of this Blu-Ray is equally impressive, rendering hues with vivid intensity but without ever bleeding or blooming. It adds to the film, bringing it to live, while the solid and deep black levels firmly root the image at all times. Another part of “Suspiria” reputation is its soundtrack by the Italian prog-rock band Goblin. The track is another signature part of the movie, adding a unique character to it and the DTS Master Audio version on this disc is superb, to say the least, breathing new life into the music. The score has never sounded better and truly becomes part of the viewing experience. From the opening notes, you know that the sound on this DVD is quite good and only helps to make “Suspiria” even more unsettling. The release also offers clear and audible dialogue, with no discernible hissing, perfectly balanced to make sure it is always understandable and never drowned out. The release comes with two audio commentaries by authors and Argento scholars, Derek Botelho, David Del Valle and Troy Howarth, offering plenty of insight into Argento’s work as a whole and, of course, this film in particular. There is tons of valuable information to be found here, so make sure to check them out. The release also contains plenty of interviews and behind-the-scenes featurettes, along with a featurette that visits the shooting locations in Germany. As has become common for these European movies that have been edited quite a lot in the past, the disc also offers up the alternate opening and closing credits, as well as alternate lettering versions. The release is rounded out with trailers and TV spots. It is time to celebrate, as “Suspiria” is now available in high definition for everyone to behold in its full, intended glory. The audio and video presentation here is exquisite and modern, and does justice to the film’s reputation for providing unique sights and sounds.